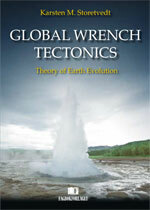 Global Wrench Tectonics, an extension of the author’s Our Evolving Planet, takes us on a ground-breaking tour of the most critical facets of Earth history. It was the gradual realization that the prevailing theoretical constructs on the Earth’s history are riddled with paradoxes and mired in conjecture that prompted the author into a long-lasting speculation on the global dynamic system. The basic precepts of the new theory – Global Wrench Tectonics – are internal degassing in association with vertical mass transfer, instigating changes of the planet’s moments of inertia. The result is a novel interlinking of the classical corpus of “first order” observational facts, presented in the form of an Evolutionary Tree, each branch being the subject of a rigorous examination in the light of the data and the author´s new theory. This fascinating and engaging text, filled with vivid descriptions and plenty of explanatory surprises, will undoubtedly add new perspective to anyone interested in the implacable human urge to explore and understand the world around us. Buy this book? Contact the author.